You can’t go wrong with this family recipe. Its flavor is fit for a king. King Joe that is , its my dads favourite he likes his topped with fresh whipped cream and sliced peaches. Oh my ! In a small bowl beat together milk eggs and vanilla. in a seperate bowl place Flour, CornStarch, Baking Powder and Salt. to the Cream Cheese mixture. Pour batter into a greased and floured tube pan. Bake for 1 hour and 10 minutes. Let cool for 45 minutes before removing from pan. Serve either plain or with sliced peaches and whipped cream. 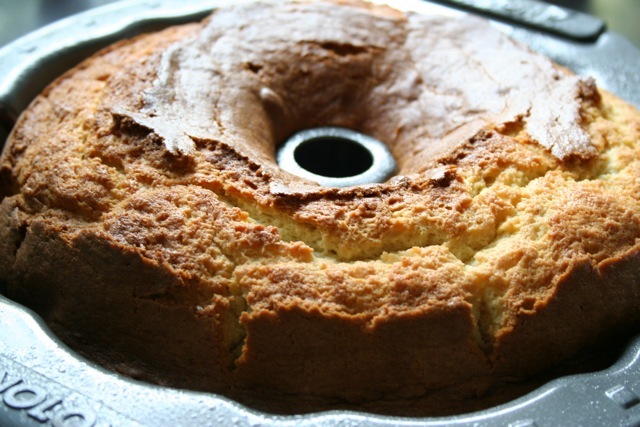 This entry was posted on Wednesday, February 22nd, 2012 at 4:19 pm	and tagged with cream cheese, poundcake, pudding, recipe and posted in Category. You can follow any responses to this entry through the RSS 2.0 feed.